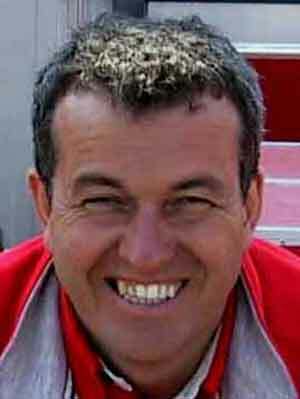 Ferrari's team coordinator is Englishman Nigel Stepney. He prefers to call himself "a glorified chief mechanic" his job being to oversee the work on both Ferraris to ensure that everything is done properly. It is a job which well suits his F1 experience as he has been involved in Grand Prix racing since the 1970s.From Warwickshire in the Midlands, Stepney grew up a keen sportsman and played football for the Warwickshire county team before becoming an apprentice mechanic with the Coventry-based Broadspeed racing team when he was still in his teens. Broadspeed prepared some of the most successful touring cars of the era, Ford Capris and Jaguars for the European Touring Car Championship. The team ran into financial trouble in the late 1970s and so Stepney looked for another job in racing and found himself working for the Shadow F1 team in Northampton.Although this team was also in decline he found himself working with Italian rising star Elio de Angelis. The relationship worked well and when Elio moved to Team Lotus in 1980 Stepney went with him, becoming de Angelis's number one mechanic in the years that followed. In the end De Angelis moved to Brabham - to be killed in an accident at Paul Ricard in 1986 - while Stepney stayed at Team Lotus and found himself working with another rising star, Ayrton Senna.Stepney stayed on until Lotus went into decline at the end of 1988 and then moved to Benetton to work with Peter Collins - who had been team manager at Lotus with him. He would remain at Benetton until the end of 1991 when Nelson Piquet suggested that he might like to run a new team in Formula 3000 called Piquet Racing. The driver was to be a young Monagasque friend of Piquet's Olivier Beretta. The team was not a success and at the end of the year Stepney was asked by John Barnard - with whom he had worked at Benetton - if he would like to go to Ferrari to try to organize the racing team in Italy. He remained team coordinator until 2001, playing an important role in ensuring that Ferrari's reliability was first rate, and is widely seen to be one of the cornerstones to Michael SchumacherÕs success in recent years.